Click above to buy your ticket! 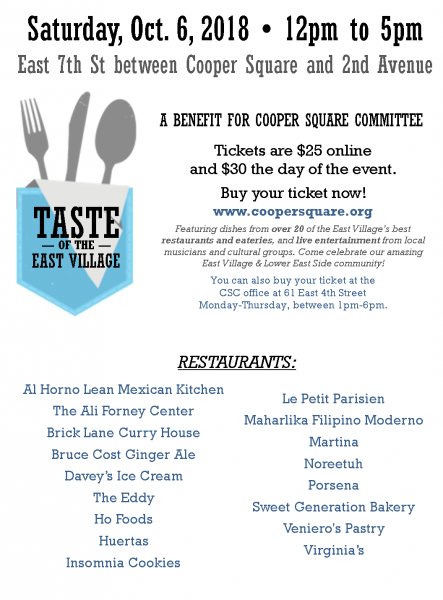 The Taste of the East Village brings together around 20 of the East Village’s favorite chefs and restaurants to benefit the Cooper Square Committee’s housing programs, and to promote the Gofundme campaign of EVIMA’s President, Jimmy Carbone, a co-founder of the festival. Local chef at Huertas at 107 1st Avenue, Jonah Miller, is chairperson of the festival committee and has selected many of the participating restaurants. Ticket holders are entitled to four dishes from participating neighborhood restaurants and eateries, including newcomers to the festival like the Eddy, Fry Guys, Ho Foods, Huertas, Maharlika Filipino Moderno,Virginia as well as returning restaurants like Brick Lane Curry, Porsena, Al Horno Mexican Kitchen, Narcbar and Le Petit Parisien. Dessert venues such as Insomnia Cookies, Sweet Generation Bakery, Veneiro’s and Davey’s Ice Cream will also be joining us. This list is still in formation and we expect some others to join us. The first 350 attendees to the festival will receive a gift bag containing complimentary appetizers or drinks at many of the participating restaurants. The festival will also include live music and a deejay, as well as more than a dozen local community and cultural organizations like Fourth Arts Block, Downtown Art, East Village Community Coalition, Bowery Alliance of Neighbors, Solar One, Tenants Taking Control, Lower East Side Ready, Met Council on Housing and many more. Some of the groups will have interactive exhibits.